On 12 April, Port of South Louisiana commemorated the 25th anniversary of operations of its transshipment centre, Globalplex Intermodal Terminal. The Port of South Louisiana has invested over $104 million in construction, upgrades, and improvements, which were made possible in part by grants received from Louisiana’s Capital Outlay and Port Construction and Development Priority Programs as well as other federal and state grants. Located in Reserve, Louisiana at the site of the former Godchaux Sugar Mill on the Mississippi River, the 335-acre multipurpose terminal, which handles, on average, 1.1 million tonnes annually, can accommodate dry bulk, breakbulk, containers and with some retrofitting, liquid bulk. Globalplex is easily accessible by way of land, water, rail and additionally, air. Invited guests included Governor John Bel Edwards, Louisiana’s US congressional delegation, senators and representatives from the Louisiana State Legislature, local officialsfromtheparishesofSt.Charles,St. James, and St. John the Baptist, represen- tatives from the district’s maritime industry, and former board members and employees. Port of South Louisiana Executive Director Paul Aucoin and Associated Terminals Chairman David Fennelly addressed those present, offering celebratory remarks during the event’s short programme, which was sponsored in part by Associated Terminals and AECOM. Globalplex was founded in March 1992 when the port recognized the benefits of establishing a transshipment centre in the heart of the River Region, chief among them the belief that such a facility was the first crucial step in the Port of South Louisiana becoming an operating port instead of a landlord port. 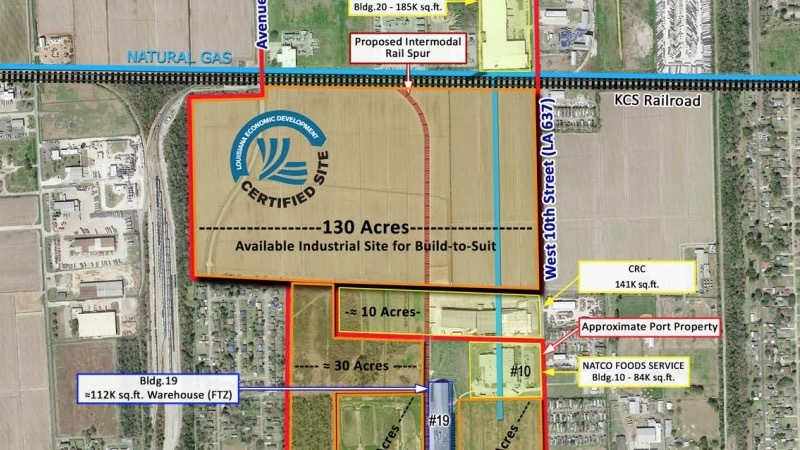 The port purchased the 205-acre Riverplex facility at the site of the former Godchaux Sugar Mill refinery from Godchaux-Henderson Properties for $11.5 million and began demolishing unnecessary structures on the site. The acquisition included a bulk handling facility equipped with a bulk dock with conveyor systems and storage facilities, barge mooring facilities, storage space, a drinking water purification plant, and a waste water treatment system. Gradually, the Port of South Louisiana added structures such as a general cargo dock (and, subsequently, a finger pier), two 50,000-tonne cement storage domes, covered warehouses and a paved open storage area, and invested in a 130-acre tract of land that the port is actively marketing to attract additional tenants. In 1996 a general cargo dock and access bridge were installed down river from the bulk dock. By the end of September 2000, the dock was extended to 690 feet in length and 204 feet in width and was equipped with two Manitowoc 2250 pedestal-mounted cranes on gantries that could travel the entire length of the dock. Additional modifications were made to the general cargo access bridge after increased activity on the dock and in 2012 a finger pier adjacent and down river from the general cargo dock was constructed, allowing the berth of two Panamax-size vessels for direct vessel-to-barge trans- loading. This addition led to modifications to the dock cranes and panzer belt, which permitted the cranes to travel the entire length of both docks. The bulk dock was upgraded in 2008, including the installation of an 800tph (tonnes per hour) Carlsen screw-type unloader. Over the last quarter century, the Port of South Louisiana added 827,000ft2 of storage space to Globalplex. Approximately half was acquired; the remaining storage areas were built throughout the facility. Since its inception, Globalplex has seen numerous tenants and cliente`le utilize its facilities; the first tenant was Hall Buck Marine, which leased the existing bulk cargo structure soon after the Port purchased the former Godchaux property. In 1997, Hall Buck leased land to its tenant Holcim, which built two cement storage domes for its operations. Past tenants/ users of Globalplex include Cal Western Packaging, Corp., Delta Beverages, Ltd. (Pepsi), and SSA Marine. Currently, resident tenants include Evonik, BARTON International, Pinnacle Polymers, LafargeHolcim, CRC Logistics Solutions, and as a result of Hurricane Katrina in 2005, NATCO and Crystal Baumer Foods. Globalplex also served as a temporary recovery base for the American Red Cross to service the New Orleans and immediate areas following Hurricane Katrina. The backbone of Globalplex Intermodal Terminal’s operation is Associated Terminals, which has been the terminal operator of the facility since March of 2005. Founded in 1990, Associated Terminals proficiently coordinates all aspects of cargo logistics, always with the customer’s needs in mind. The terminal is what it is today in great part because of their hard work, support, and expertise. As a result of Globalplex’s development and construction, the Port of South Louisiana’s staff numbers have tripled in size since 1992. Future plans for Globalplex include further construction of warehouses and buildings to attract new tenants and users and a new administration building built on- site to house the full staff of the Port of South Louisiana. While Globalplex is physically located in Reserve, the Port of South Louisiana’s current administration building is located in LaPlace.